Click on the VIRTUAL TOUR LINK to see a professional video!! 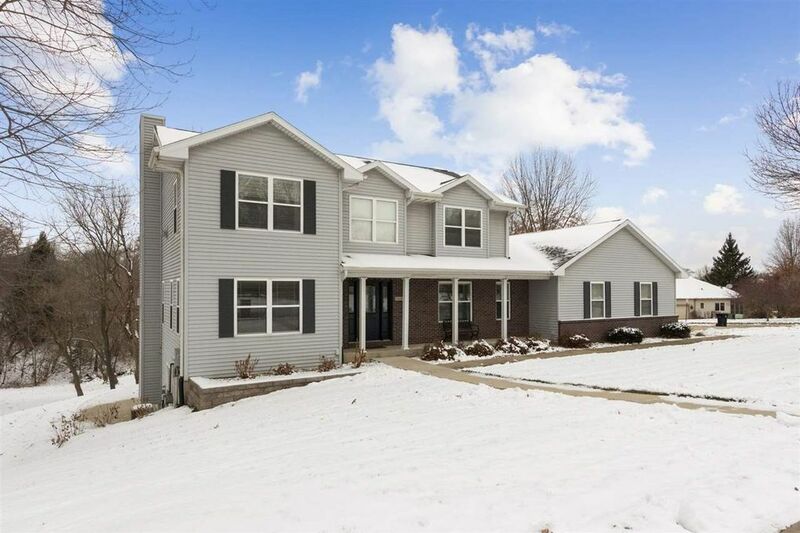 Tastefully remodeled and improved over recent years, this classic 2 Story has so much to offer and it's situated on a .60 acre double lot with private wooded views in beautiful North Coralville! Special features include an expansive 1040 sq. ft. side load 3 car garage; drop zone with real lockers for great storage plus a convenient 1st floor laundry room that comes with a utility sink and the Samsung front load washer/dryer; spacious kitchen that boasts granite countertops, breakfast bar, designer tile back splash, 6x6 walk-in pantry, and shiny appliances including a Samsung range/oven and French door style refrigerator; warm hardwood flooring; sunny 3 seasons room with floor to ceiling windows, cedar plank ceiling, carpet and adjoining maintenance free deck with stairs to a large patio; dramatic 2 story entry; gracious formal dining; 1st floor family room highlighted by a floor to ceiling stone fireplace; 4 upper level bedrooms including a tremendous master suite featuring a corner fireplace, walk-in closet and luxurious bath with an all tile shower and extra deep soaking tub; walkout lower level with bamboo flooring and a fantastic walk behind granite wet bar with seating for 4; large storage room with built-in shelving plus an 8x13 garden room with double doors; white painted trim and raised panel doors; elegant main level powder room; custom window treatments; and professionally landscaped including some impressive retaining walls built with concrete footings to last! Call to get a copy of the lengthy improvement list. Lower level finished sq. ft. is an approximation. Directions: Holiday Rd. to Oak Lake Park Rd. to Red Oak Dr. or use Timber Hills Dr. to Red Oak Dr.